Combining an Apprenticeship in Brain Injury Rehabilitation with her experience in Spinal Cord Injury seemed like natural progression for veteran health worker Sally Brown. 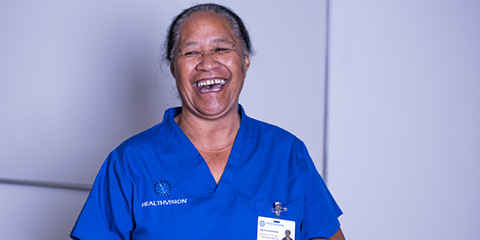 But Sally is not your average Apprentice – she is also the lead Assessor for Healthvision, overseeing a team of around 200 support staff in the Auckland region for the specialised home healthcare provider. Sally Brown is not your average Apprentice. She says the appealing part about this Apprenticeship is the opportunity to expand her scope of practice and increase her skills and knowledge in brain injury rehabilitation. “When I started in Healthvision, my focus was on spinal cord injury,” Sally says. “As the years have progressed and the medical profession has moved, we understand there is a strong connection between spinal cord injury and brain injury. So, for me, combining brain injury with spinal injury is a natural progression,” she says. Starting her career with Healthvision in 2009 as a community support worker, Sally now delivers the organisation’s training and assessment programmes for the Auckland region. “I have advised managers that I have reached the penultimate of my career and this is it,” she says. On a weekly basis, her role takes on three important aspects; as the staff trainer in a team training and one-on-one advisory, as well as an oversight with client role. “Behind all of that is the administration role, taking our workforce throughout their training requirements and their work life here with us,” Sally says. Currently, Healthvision have 70 of their Auckland staff enrolled in Careerforce’s New Zealand Certificate in Health and Wellbeing (Level 3) programme, while Sally is part of a pilot group of eight studying the Level 4 Apprenticeship programme. She says the new learning is essential for her to succeed in her training role and support her staff through their own training journeys. From Sally’s perspective, while different clients require different levels of care, there is one key skill she wants her support workers to have. “We want to work holistically with a client and include their external parameters, like their family and how they live and their environment. So, our clients need the assurance and confidence that the person who is in their home is the right person to care and support them to complete their rehabilitation,” she says. Through the support of Careerforce, the Industry Training Organisation for the Health and Wellbeing sectors, and her employer Healthvision, Sally and her team can gain nationally recognised qualifications on and off the job. Sally says the best part of her role is the opportunity to encourage the personal and professional development of her colleagues. “In my role, it’s about monitoring and challenging the support worker. It’s about enlarging all of that knowledge and drawing it out of our support workers,” she says.